IMPORTANT - Restrictions on use If any horses become seriously disturbed by your flying, PLEASE leave that area immediately and inform the club's sites officer. A pleasant change from the inland sites. It doesn't appear too inspiring but actually works well. Can often be flown when inland sites are blown out. Suitable for training & novice CPs as long as they don't stray from the site and they respect windy days. It's a good site to scrub up your CP skills if you're rusty! The junction of the north/south road with East Road; this was where the Post office used to be. The road to the west leads to the parking area. Approach from the A595 to the village of Lowca. The road to the site starts at the war memorial and goes west past the rugby pitch. Note that the post office shown on the map is now closed. Suitable for novice CPs as long as they don't stray from the site and they respect windy days. Beware the railway, don't fly low over it, or land, or walk along the tracks. Beware barbed wire fences behind and in front of take off. Remember the bottom landing is off to the south, if you are getting low, slope land or make for the beach early! Don't fly too far north in marginal conditions, no beach just slabs/boulders. If going North, take care flying past the wind turbines. A friendly site frequently used for training. Take off is smooth and grassy, some places need ground handling skills to cross the lip of the top terrace. Re Hang Gliders: The original hangie take off is now in a horse paddock and is unavailable, so you'll be mixing take offs with floppies and trainees... please make allowances! 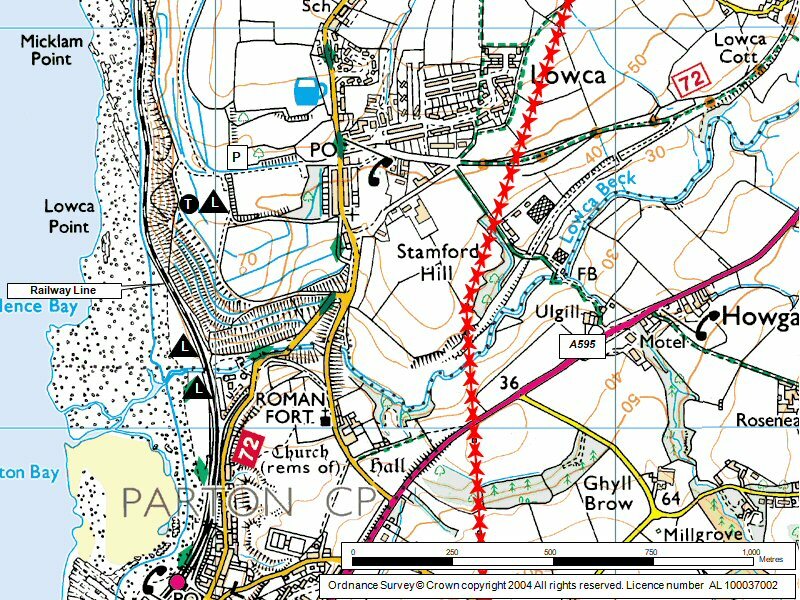 Otherwise the site is straightforward in most respects but don't go too far north if low. Only safe bottom landing is south of takeoff. PLEASE PARK HANG GLIDERS AWAY FROM TAKE OFF/LANDING AREAS AT ALL TIMES. The bottom landing is to the south on the beach. There is usually sufficient space to land above high water mark. Top landings are back at take off. If it is windy enough to be blown back then consider landing down on the beach. A ridge run north to Harrington is possible when conditions are good, a breeze with a bit of north helps (WNW). 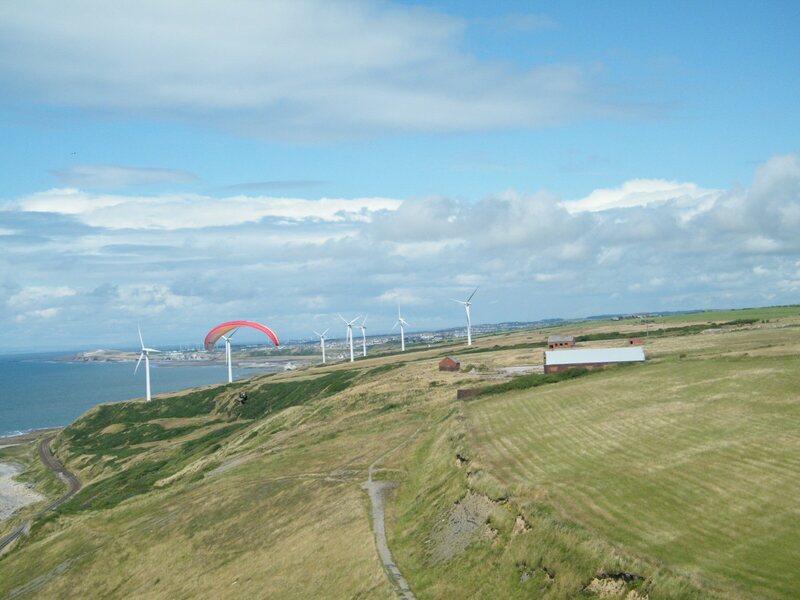 You will need to negotiate flying in front of wind turbines and bottom landings can be difficult (steep scrubby banks, railways, bouldery beaches or the sea) so take care. 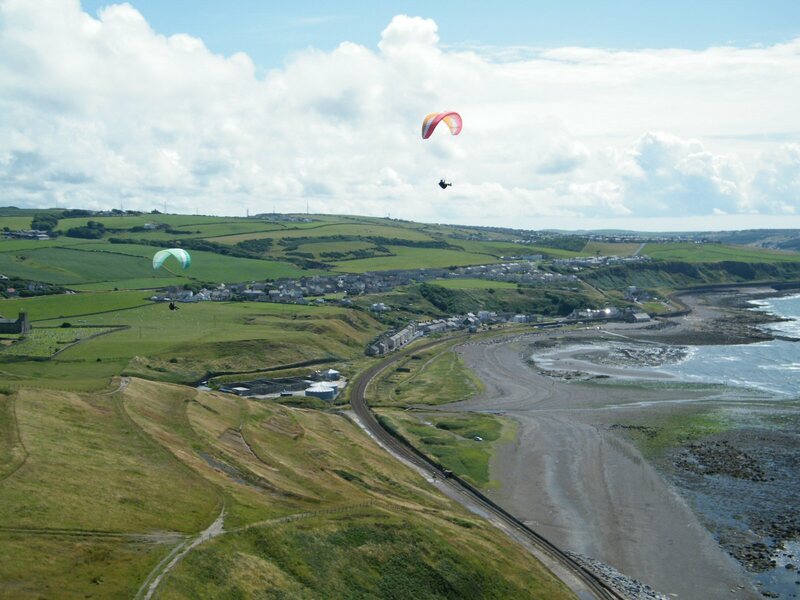 Flights south to Whitehaven, and even St Bees, have been achieved by the experienced and/or brave pilot, it does involve some difficult transitions and watery glides! The take off and landing area at Lowca. 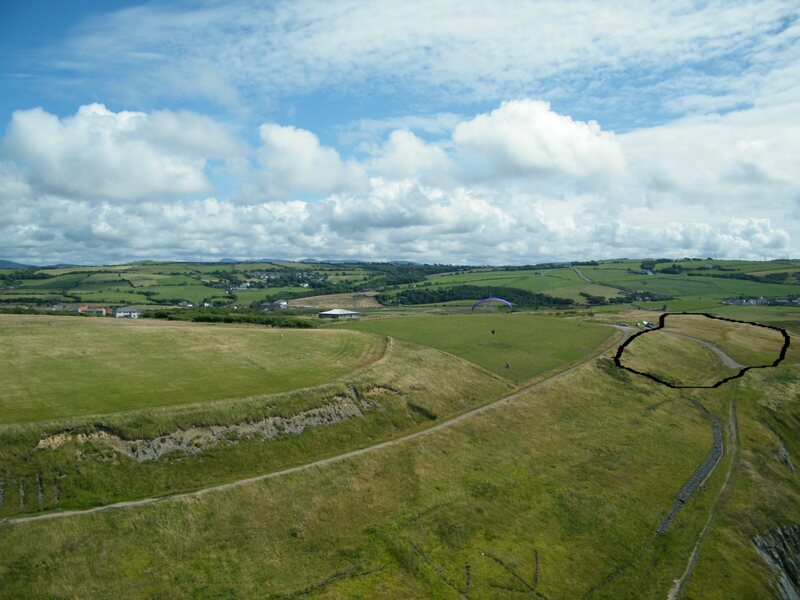 The area to use is to the right of where the cars are parked - to the right of the paraglider. Use the brownish area above and below the track running 4 o'clock from the cars as indicated by the black line. Photo by Pete Rycroft. Notes : Igc file is in the XC League. Malcolm Grout flew on to St Bees, but hasn't claimed the record or produced an igc file!